In this article, we describe 10 spots that are only accessible by car, and currently being popular through word of mouth. 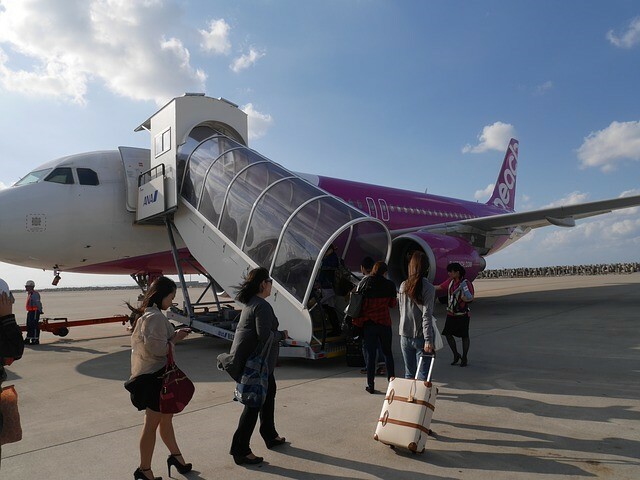 We also added an introduction of traffic conditions and rules in Okinawa that you should keep in mind. 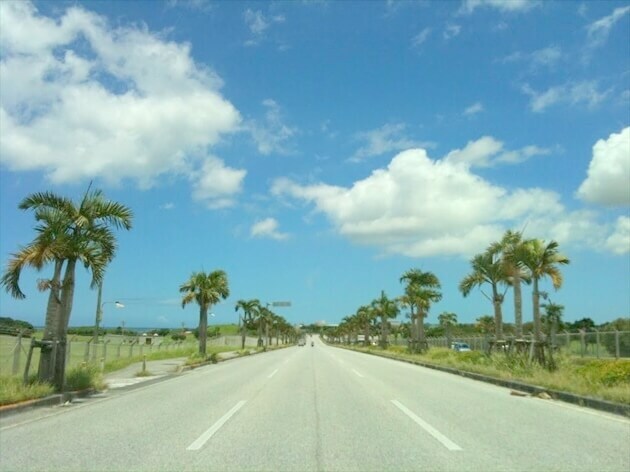 Kaichu Road is a road located in the central area of Okinawa that runs over the sea. It is approximately 5km long and it’s a toll-free road. While driving, you can see the shimmering sea that varies in color depending on the strength of the sunlight on a given day. By driving along Kaichu Road, you will find 4 unique islands. Henza Island, more than half of which consists of oil tanks. 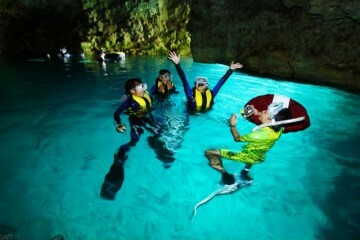 Hamahiga Island, whichis said to be a place where gods live and any wish can come true. 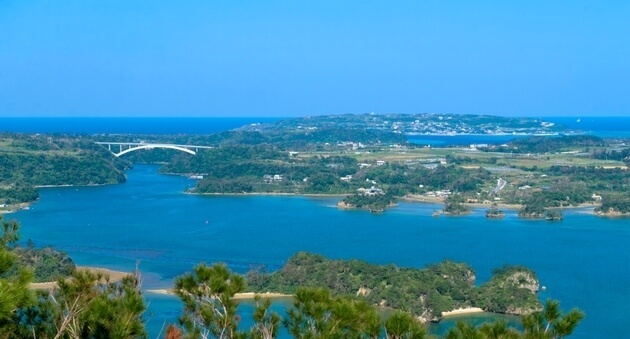 Miyagi Island, which has steep ups and downs, and a very beautiful view from its hilltop. 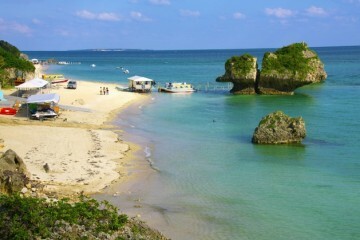 Ikei Island, which has Ikei Beach. You can go around all four islands by car as bridges connect them. 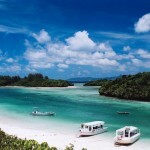 This is Otomari Beach on Ikei Island, around 30 minutes from Kaichu Road. 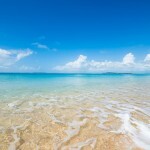 It is a little-known natural beach. 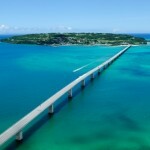 Kouri Bridge has been recently reported as a top driving spot by several media outlets. You can enjoy changing views from the straight road toward the bridge as it has a wavy structure. 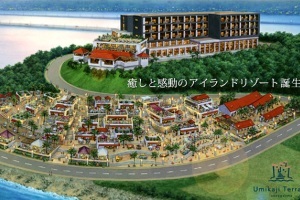 Kouri Ocean Tower has recently opened on Kouri Island, and there is a beach under Kouri Bridge that has incredibly clear water. Make sure to bring your swimsuit! Warumi Bridge is 315m long and opened in December 2010. 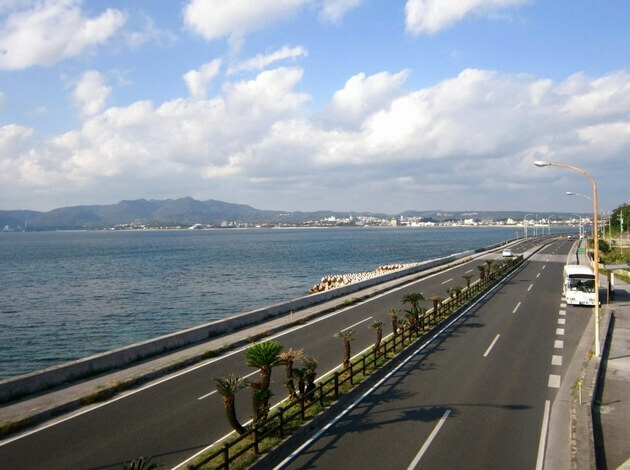 It fulfills an important role as a trans-strait bridge connecting Okinawa’s main island and Yagaji Island. 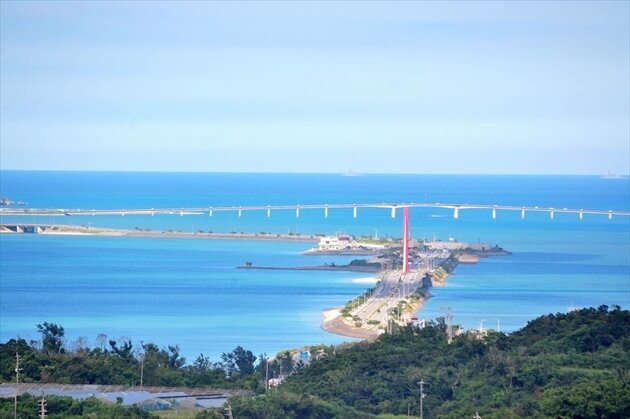 The bridge overlooks Kouri Bridge and the island, and the sea underneath sparkles with a deep emerald green color. 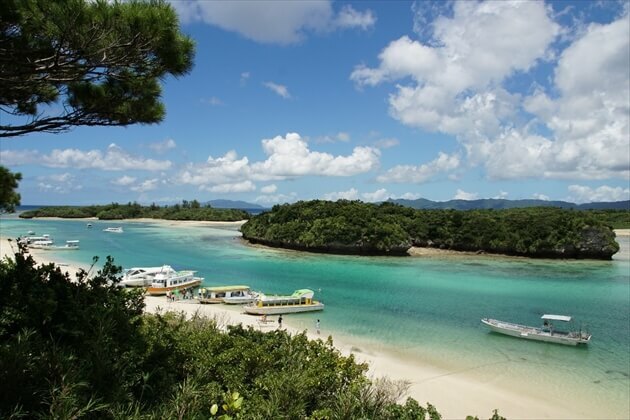 We recommend a route passing from Nakijin Village to Yagaji Island. The bridge declines, so you can enjoy the thrill of descending. Furthermore, it is also fun to take a walk over the bridge. There are available parking spaces in front of the bridge. 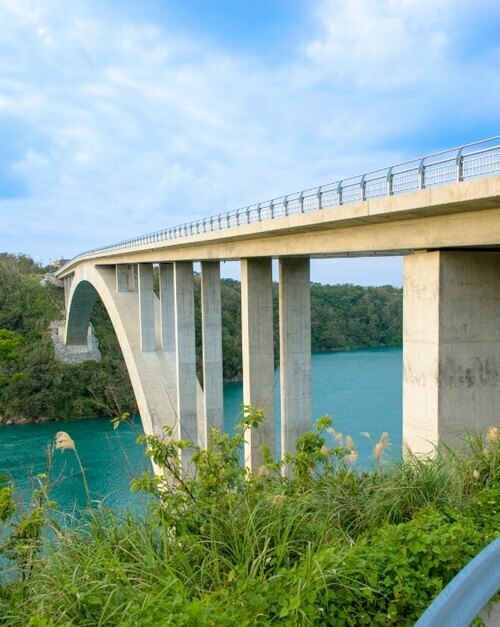 This bridge is 660m long with a lot of twists and turns. It diverges into Nirai Bridge and Kanai Bridge. Currently, the two bridges are connected and called Nirai Kanai Bridge. You can enjoy the spectacular scenery while descending as the highest point is around 80m. It also overlooks Kudaka Island and Komaka Island. 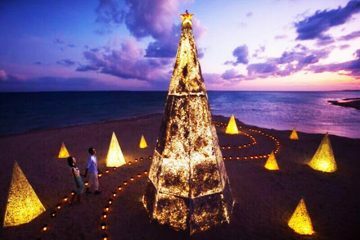 ★The meaning of Nirai Kanai: A spirit world exists far east over the sea. 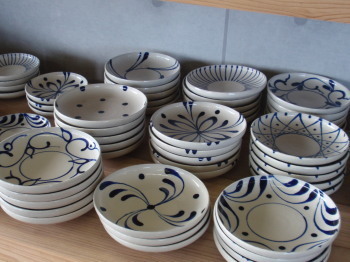 A legend says that this spirit world can provide us with wealth and fertility, and give rise to life. 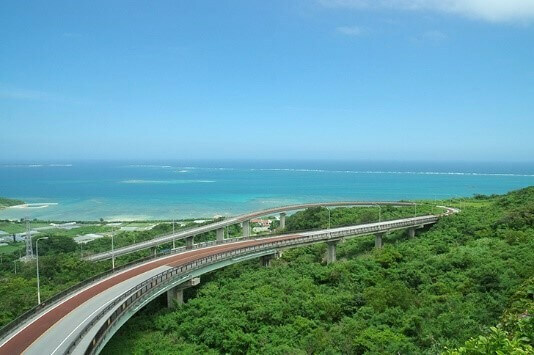 Route 58 is the road located on the west coast in the central part of Okinawa’s mainland, where you can drive through the main island without using the expressway. 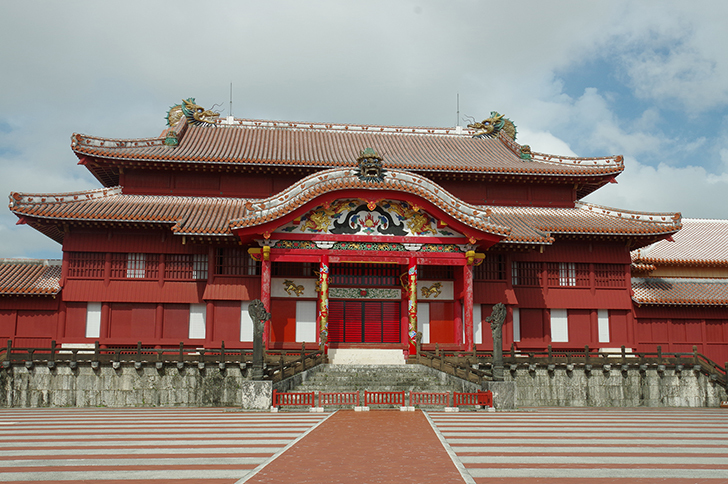 Going north toward ‘Kadena’ roadside rest area, you will find the Kadena Base. The trees on the both sides decorate the road, and you can enjoy an exhilarating ride. 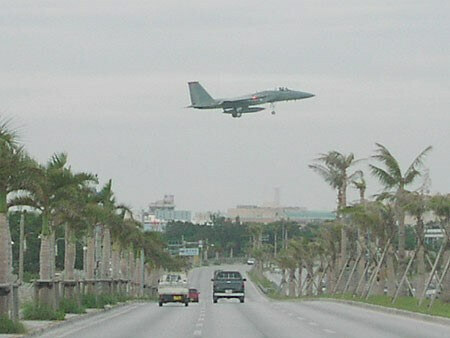 It is a popular and thrilling place to drive because you can see U.S. military jets flying in and out if you catch them at the right time. 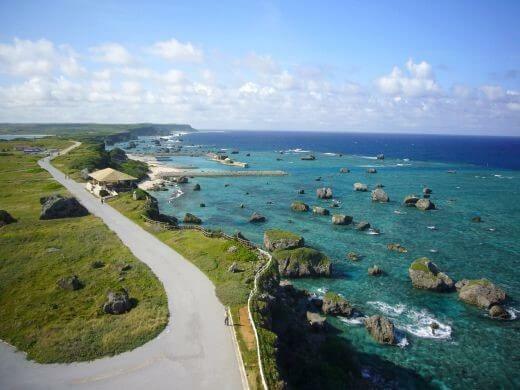 Going north on Route 58 all the way through the main island, you will find Cape Hedo located at the northernmost point. 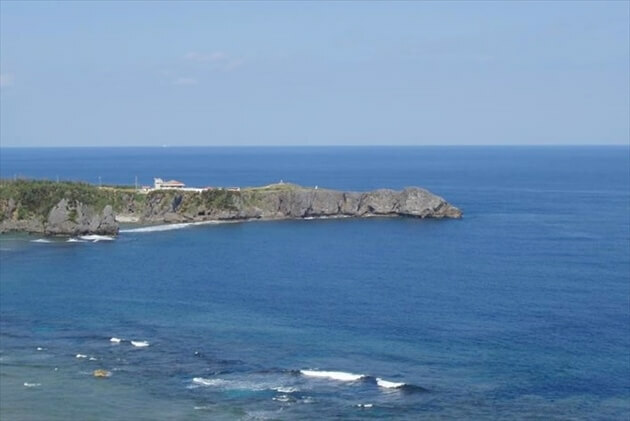 It is the northernmost cape of Okinawa’s main island where rough waves from Pacific Ocean and East China Sea crash into the rocky cliffs. 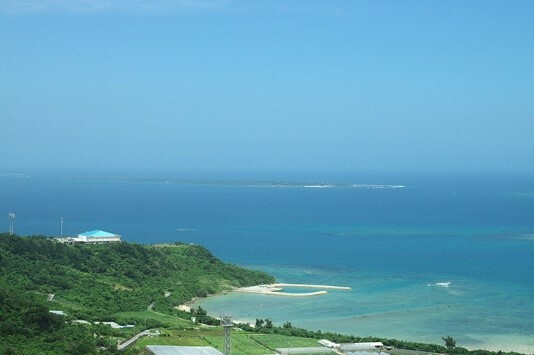 You can see Yoron Island and Okinoerabu Island about 22km away by the naked eye when it is sunny. And there is ‘Kayauchi Banta’ in Kunigami village, a sheer 80m cliff facing the East China Sea. Be sure to stop there on Route 58 on your drive. 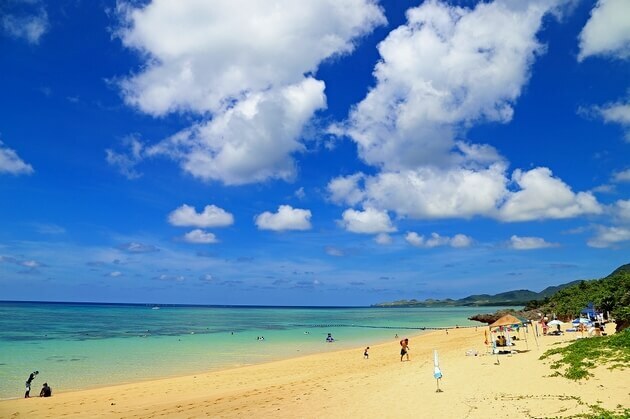 It is also famous for a scenic spot where you can see a wide view of the sea at the Okinawa Seashore National Park. 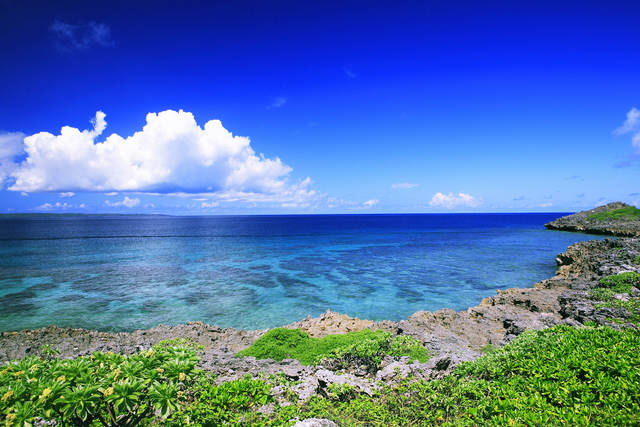 A bay located in the northwest of Ishigaki Island in Ishigaki City, Okinawa. 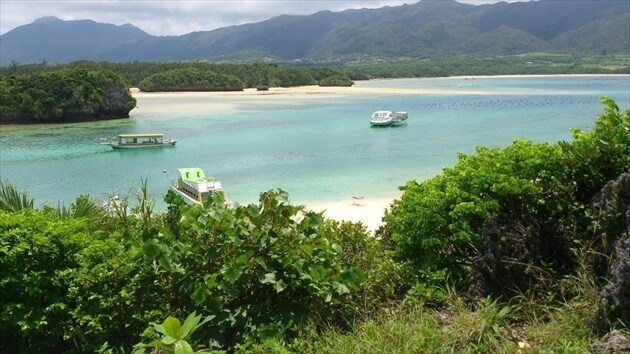 It is a scenic spot that represents Ishigaki Island. Go north on Route 206 heading to the northernmost point, and then you will get to Cape Hirakubo. 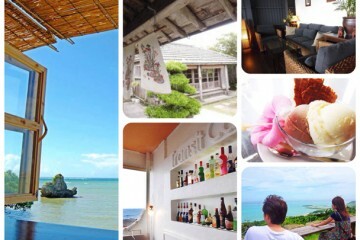 With a wide view of the sea’s horizon, the vast panoramic view of the East China Sea is overwhelming. This place displays a beautiful contrast with the stark lighthouse. You can drive around the perimeter of Miyako Island in a big circle. 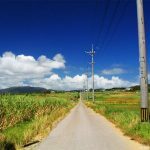 Sugarcane fields line both sides of the road, and a beautiful mountain road will make for beautiful photos. Ikema Bridge is one of the main driving attractions. 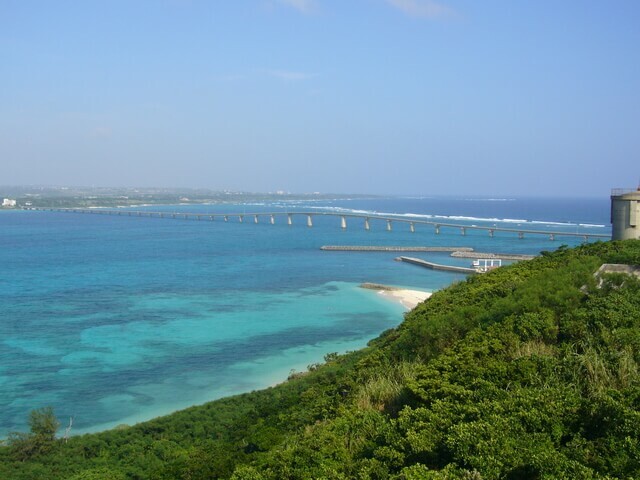 It is a bridge that is 1,425m long connecting Miyako Island to Ikema Island. 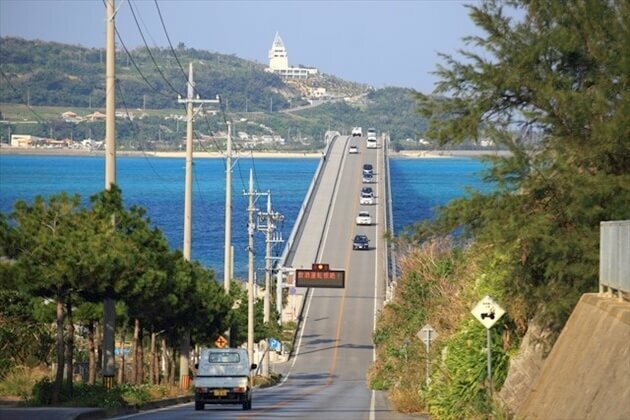 It is famous as a refreshing drive spot where you can view Miyako Island’s crystal clear sea from the bridge. Kurima Bridge is 1,690m long. 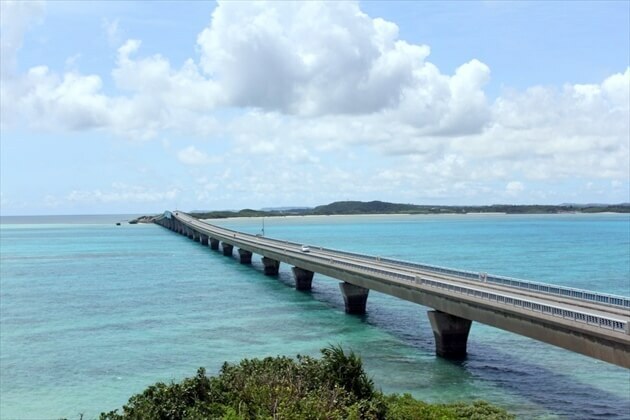 This makes it the second-longest farm road bridge in Okinawa behind Kouri Bridge, which was built later. Since each bridge drive has totally different views, we do hope you can enjoy the views from the bridges’ connecting islands. 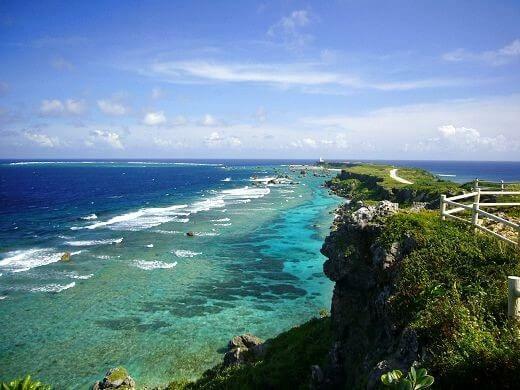 Higashihennazaki is located at the easternmost point of Miyako Island. 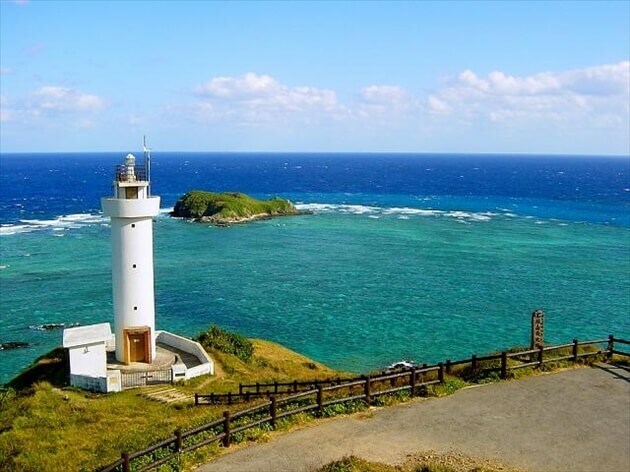 It is a picturesque spot that was selected as one of the most scenic places in Japan and represents Miyako Island. The landform jutting out into the sea extends 2km. The parking lot is located at the very front, and it takes about 10 minutes to walk to the lighthouse slowly. Some trouble could ruin your fun drive! We provide you with several points to take note. 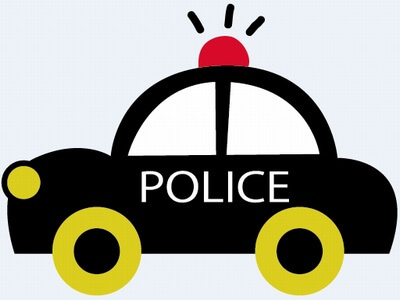 But, car break-ins or thefts actually occur, and thieves tend to target such a short time. You should stay cautious even for a few minutes. We suggest you to lock the doors whenever you get out of your car. A refreshing drive with an ocean view. 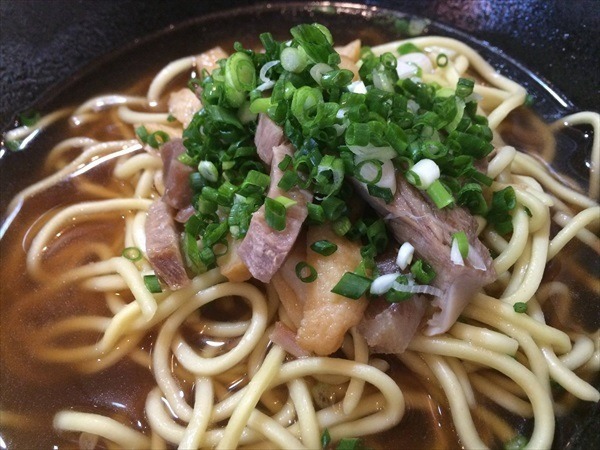 It easily happens… You unconsciously drive over the speed limit. There are many stories like this where drivers focused too much on the scenery only to find a police car tailing them. Inattentive driving also might cause a traffic accident. 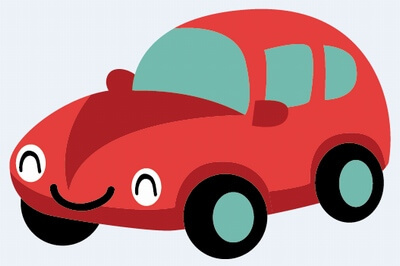 Please remember to pay attention when going out on a leisurely drive. Route 58 is one of the roads you will use when you drive on the main island. Please look at the pictures. Actually, the leftmost lane is for busses only (depending on the time), and individual cars are prohibited. Remember to be aware of the road signs. Also, some rent-a-car shops provide road maps with bus lane information. Please ask for one of these maps when you rent. 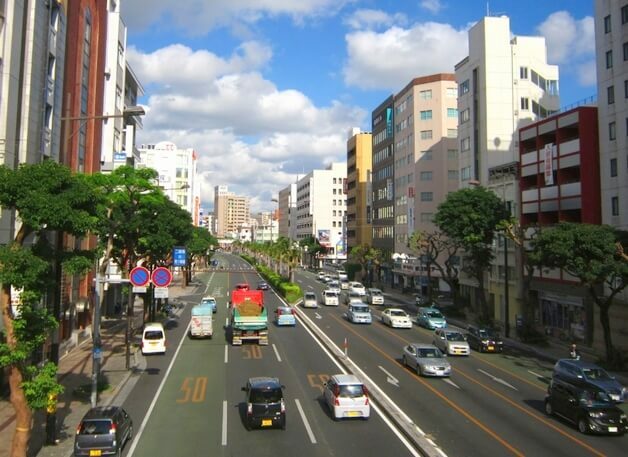 The most important thing to keep in mind, especially on a rainy day…is that Okinawan roads are slippery. 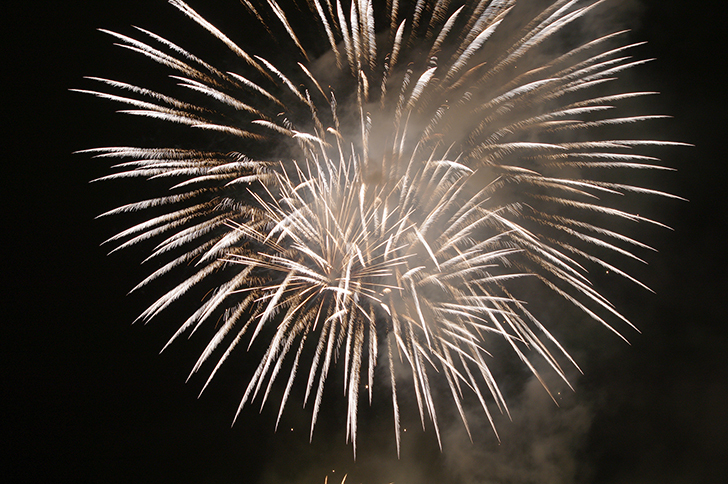 This is because one of the materials used for road construction is limestone. Please avoid accidents such as rear-ending, or getting rear-ended. 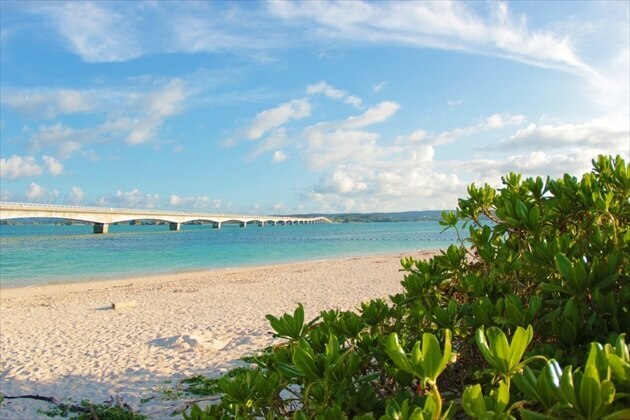 Okinawa has a lot of spots that you can enjoy even when just passing through. 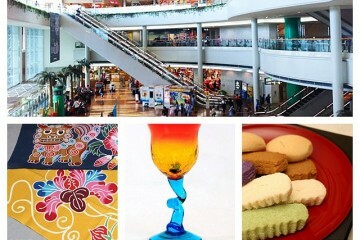 Depending on the time you visit, each place has a different feel. So, if you have any favorite spots, please enjoy visiting them at different times of day: morning, noon, or sunset. Surprising beauty! 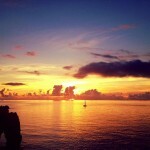 14 Okinawan Sunset Spots!